Nestled upon the edge of a New Forest village in southern England, bordered by woodland and open fields, this recently built country house is defined by its owners’ passion for Nordic architecture and design. Woodpeckers contains a striking collection of midcentury furniture by Alvar Aalto, Hans Wegner and Bruno Mathsson, among others; and its design is infused with Scandinavian influences that stem from a happy synergy between the owners and their architect, Magnus Ström, who grew up in Sweden immersed in the region’s modernist legacy. site of a 1960s bungalow that they hoped to reinvent or replace. 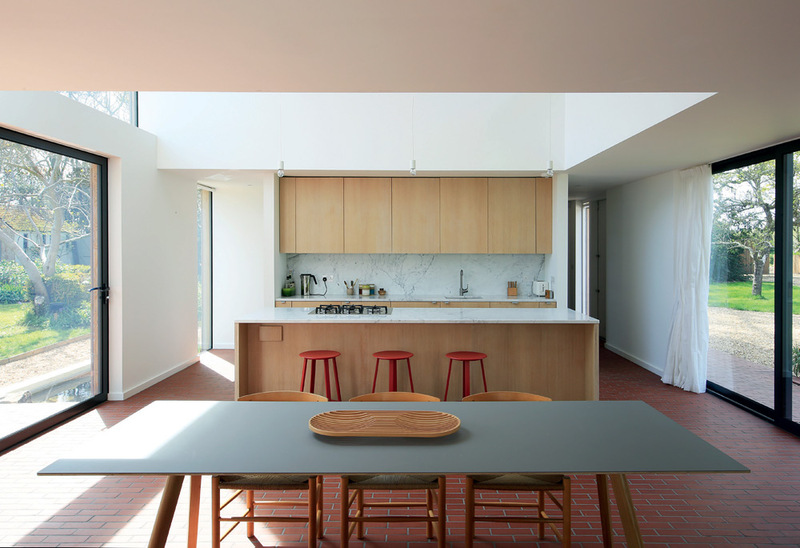 The replacement house is a two-storey timber-framed building set on a brick plinth and clad in larch. Ström was keen to avoid traditional punched windows, of which there is only one, and opted instead for banks of floor-to-ceiling glass that maximise connections between the interior and the landscape. In the open-plan living space on the ground floor – with a seating area, a dining zone and a kitchen – this relationship is enhanced by a projecting conservatory and terrace. 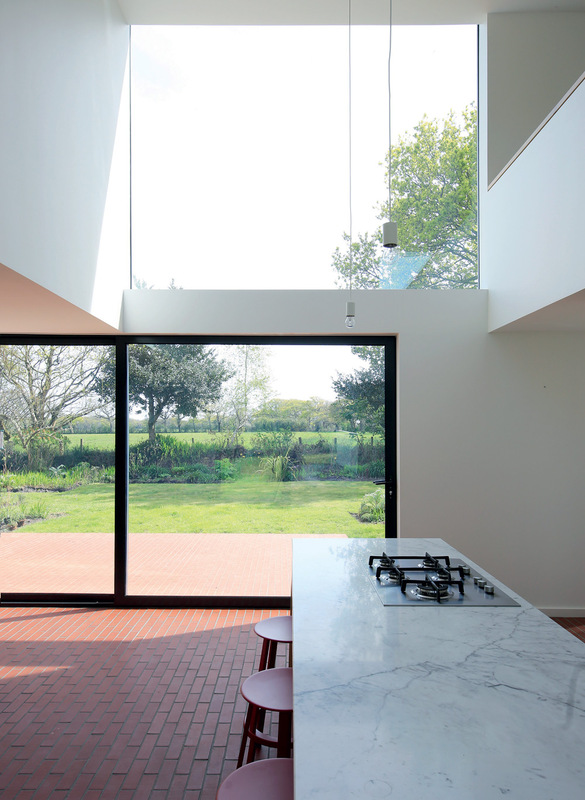 Another key feature is a double-height atrium around the dining table, with a two-tiered wall of glass looking out onto a meadow. This open void introduces a sense of scale and volume that makes this fairly modest home (195 sq m) seem more generous than it is, while also helping to connect the two levels of the house. The ground floor also hosts utility spaces and a private den, while there are three bedrooms upstairs. Ström has a number of residential projects under way, in Dorset, Rutland and London. There’s also work back in Sweden, where he is designing an island home near Stockholm and working on the refurbishment of a midcentury house near Jönköping, at the southern end of Lake Vättern. Ström grew up in Gothenburg and southern Sweden. His parents (an accountant and a language teacher) built their own home, furnished with Bauhaus and Aalto furniture, and he took an early interest in architecture. Faced with a limited number of architectural schools in Sweden, Ström looked further afield and went to study at the UK’s Portsmouth University, where he could also indulge his passion for sailing. One of his tutors was architect John Pardey, who is known for his carefully crafted country houses. After a year working in Dublin, Ström was offered a job by Pardey. Like Pardey, Ström has focused much of his work on the unique character of the contemporary country house. Woodpeckers is the first of a sequence of projects, which have different settings but are bound together by a focus on materials, structural order and craft. For Ström’s clients, who divide their time between London and the New Forest, there is evident pleasure with the warmth and cohesion of the house. ‘The sense of light and space is very special,’ they say. ‘We loved the combination of the sea and the woods in the New Forest and the relative isolation of being down a track and surrounded by trees and fields, so the connection with the outside was a key component of the design process for us. This becomes the essence of being at the house, when you are moving around it or when you are sitting down. Aalto’s houses were an influence, but so was the work of Aldington and Louis Kahn, and our interest in 20th-century design sits really happily within the house.